IBR Special Projects Editor Jeanne Huff (left), Woman of the Year Kristin Armstrong, and fellow honoree Sue Paul, the executive director of the Warhawk Air Museum in Nampa. Photo by Pete Grady. 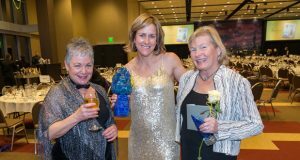 Three-time Olympic champion Kristin Armstrong, director of community health at St. Luke’s Health System in Boise, was one of 50 women honored March 9 at IBR’s Women of the Year event at the Boise Centre East. Armstrong has won three Olympic gold medals in bicycle racing, and in her job at St. Luke’s focuses on bridging the gap between disease prevention and community health.